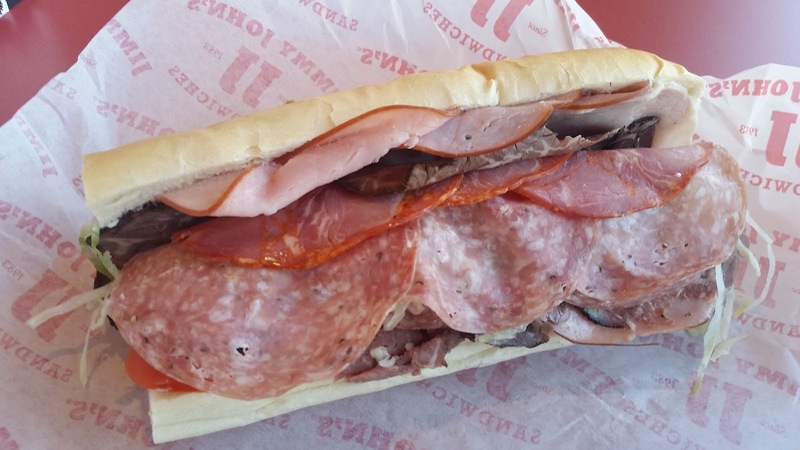 Jimmy John's is the Subway killer. Their pricing is a little more than Subway ($5.99 - $8.99) but their subs pack much more flavor and they use better quality meat. Subway has also been jacking up their prices lately. They still have their $5 foot longs but it's only 1 sub that rotates depending on the day. For some reason I really hate black forest ham and that's usually the sub of the day when our office decides to go eat there. 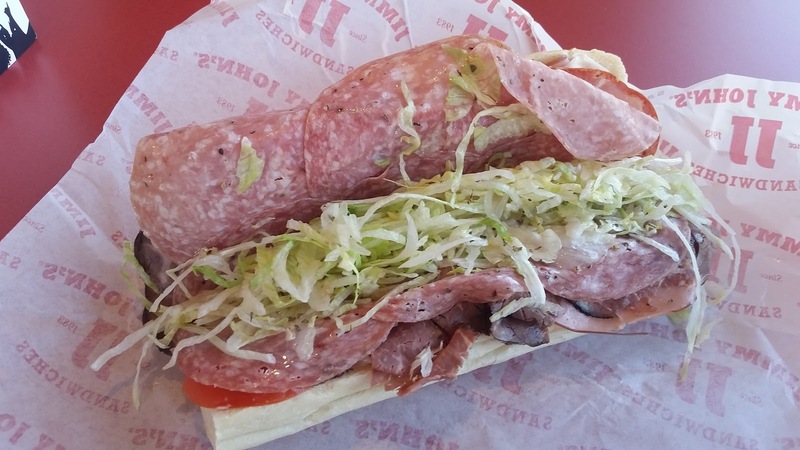 Jimmy John's has a couple awesome unique things about it. First, they deliver. I haven't used their online ordering or delivery yet but it's great to know that we can order food and have it delivered if we're feeling just the right amount of lazy. Second, they are lightning fast. It's really weird because just as you're finishing up with the cashier, someone will call your name and your sandwich is ready. The first time it happened to me I was shocked and confused. I didn't think it'd be ready that fast. 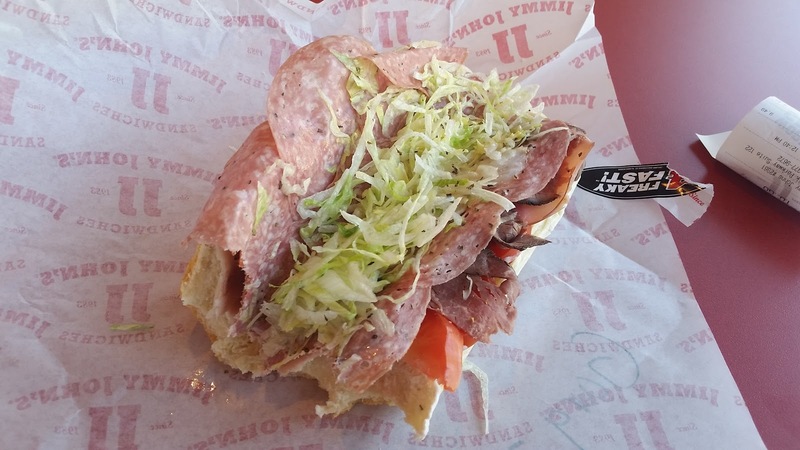 I went all out this time and got the J.J. Gargantuan ($8.99) which has a bunch of tasty Italian meats doused with a tangy vinaigrette. They don't really let you customize your sub too much which is how they can get it out so fast but I really wouldn't change much about it anyway. The sub in my hand. Let's compare this to a Subway sandwich that I got. The lettuce they use is thinly sliced and crisp. Subway usually has that black plastic bin of lettuce that has all the pieces that are slowly browning around the edges. Our office actually went to subway yesterday and I didn't get anything because I was so spoiled by Jimmy John's. I was curious about the store and looked up what a franchise would cost. I've looked at Subway before and know they're one of the cheapest to open. To open a Subway you need $30,000 and your gross net worth has to be $80,000 and it costs about $160,000 - $200,000 to build one. 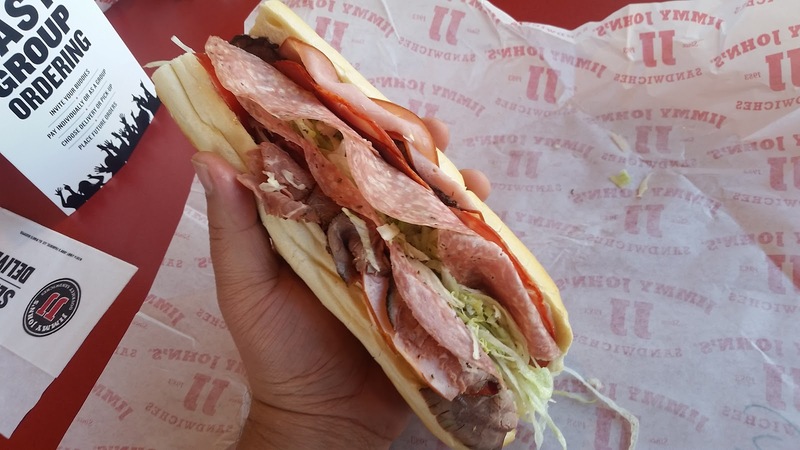 To open a Jimmy John's you need $80,000 and your gross net worth has to be $300,000. I didn't see specifically how much it costs to build one. I hope people start opening franchises near where I live to fight the swarm of Subways that we have. If you ever get a chance to eat there, I suggest you try it!